As a child Gordon spent a good part of his time tromping around the forests in Montana and Colorado, never far from home but always dreaming of and searching for a real cave. He found various small caverns to explore but non of them was interesting enough to qualify as the cave of his imagination. "...Note that I use the term 'spelunker' to denote someone untrained and unknowledgeable in current exploration techniques, and 'caver' for those who are." Ultimately Gordon's caving experience in Colorado was brief and unspectacular probably best defined as Steve Knutson might as 'spelunking'. It wasn't until Gordon went to Indonesia in the early eighties that he saw the potential for film and caves, but at that point the portable lighting technology was heavy and limited. The film he shot in those days was always dark and grainy and cameras suffered terribly in the muddy, guano filled environment. "It was 1986 and we were headed to Chiapas to film for National Geographic Explorer. 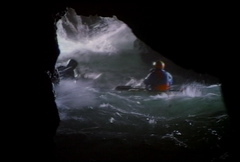 Cully Eardman thought that the local caves would augment our kayaking show and introduced us to Scott Davis. Scott had pioneered caves like Chen Cave in El Chich Gorge. 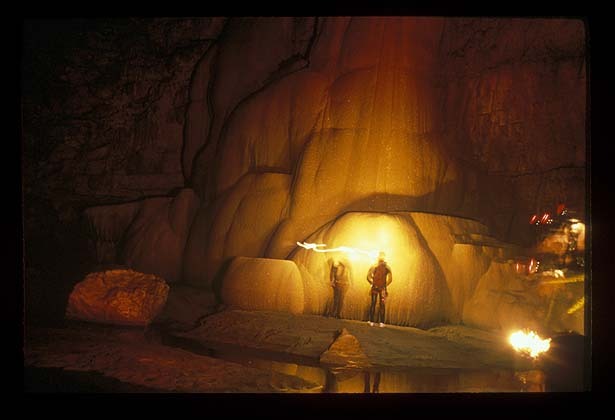 Again we managed incremental steps in lighting from the days in Suluwesi to film Chen Cave." This time they would use fog lights hooked to motorcycle batteries mounted on their kayaks while 16mm gun cameras called Gzaps would be water housed and strapped to the decks of their boats. "The results were emersive but the film speeds were limited to 100asa which combined with a 120degree shutter still didn't give us enough light for a good image when we went deep." says Gordon. "It wasn't until our 3rd trip to Chiapas to make a film for ESPN in 1993 that we got it right. My brother Michael and I acquired a Photosonics 1VN which though twice the size of the Gzap allowed 3 minute loads in any asa and running speeds up to 200 frames per second. We finally nailed it in another cave called El Churriaderro near Tuxtla Gutierrez. By this time I also had better lights and a handle on the nature of carbide lights.... It was like Disney Land, there were so many incredible moments on that trip." This film went on to win an Emmy Award for Cinematography, Gordon's first. Just before that trip Gordon made his first film with the Tsunami Rangers and discovered "Littoral Caves" on the coasts of California and Oregon. The "Rangers" would call his efforts Fellini-esque "It was like bombs going off with smoke and fire, I am sure those caves will never seem the same again, there was smoke and water, carnage everywhere" Says Commander Eric Soares. That Film went on to win "Best Children's Film Award" at Telluride Mountain Film Festival. The next big caving expedition was in Borneo with John Lane and Subterranean Explorers exploring the second largest system so far discovered in Malaysia. The production group under Gordon's direction was tasked with making a video program for American Adventure Productions to aire on OLN. "Flying into Miri Sarawak for the Gunung Buda Exploration we met the writer for National Geographic Don Webster boarding the return flight to the US. He had cut the palm of his hand wide open with a "Perong" the Borneo equivalent of a Jungle Machete. Only a day old, it was severely infected and the trip for him was done. Shooting video for the first time in caves was very easy in terms of longer run times on tapes between changes and the light weight housings that were available for our cameras as well as being able to see what we were getting on location. This was the first time I used the 200 watt HMIs but we had to power them from a small generator. I had to limit burn time to a few minutes at a time because of the exhaust. The amount of light was staggering and we got a great show that ran parallel to an article in 'Nat Geo Mag' and won another Emmy Award for videography, this was my 3rd!" From here Gordon had a few smaller caving expeditions but the next notable trip was to Greenland for the IMAX film 'Journey Into Amazing Caves' "This was my second film with MacGillivray Freeman Films. 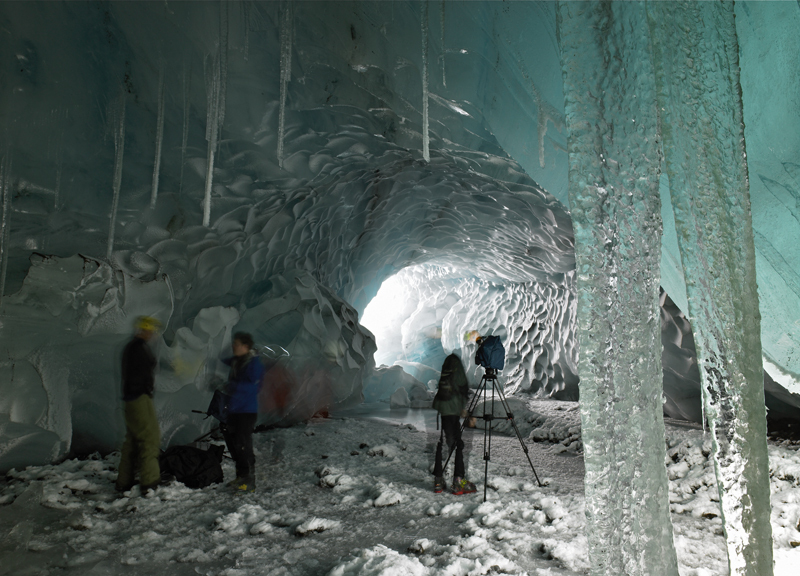 I was to direct photography in vertical ice caves with a 60 pound camera! This meant not only lighting 600 foot deep shafts plumbing the Ice Cap but securing the crew on platforms for shooting from a tripod that would hold two of us and the camera. For this film I hired my 5-time Mt. Everest Summiting brother Mike Brown to work with me. The result was the highest grossing Large Format Film in 2001. This film like many IMAX Films took 2 years to release. In 2001 Gordon teamed up with John Lane again to make a program in Sumatra. 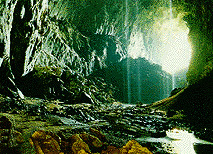 The area was called Gunung Nalu Cerebu or 'Mountain of 1000 Caves' The resulting film would be sold in several markets including NBC. The scenario here was fairly refined as far as lighting and camera, however because it was self funded Gordon's team could not bring as much equipment as was needed or scout the way they wanted. As a result they were stopped at 2 sumps that might have yielded much more virgin passage. The show was still a success and received critical acclaim. In 2006 Discovery decided to look at another potential Hi Definition series, 'What Lies Below' Rob Katz at Pilgrim Films and Television contacted Gordon to direct photography this film for them in Iceland. "The most spectacular thing about our time in Iceland was the travel which involved monster trucks traveling over the snow taking us to the most amazing ice caves with hot thermal rivers flowing through them. This was truly another apex caving experience. Iceland is full of incredible sights, historical facts, Jules Verne's "Journey to the Center of the Earth" was According to our local guide based on caves in Iceland. 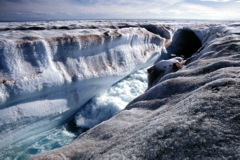 Gordon had heard this about Svalbard, North of Norway while he was there, in the '90s making an adventure travelogue. The caves in Iceland made it much easier to believe that story originated in in this icy playground. "We rappelled into the rift that is the divergence of the Atlantic and North American Continental Plates. where else could you stand with one foot in Europe and One foot in America or at least on the plate, to top it off another very comfortable hot stream flowed between, so you could sit in the hot pool watching the snow filter down between the Continental plates." 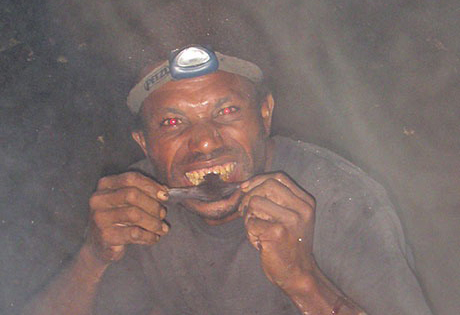 Gordon made a trip to Papua New Guinea in the South Pacific with John Lane and Ralph Cutter in the Summer. "We went with the idea that we might find a plain shot down in WWII from which Fred Hargishimer evaded capture by the Japanese until the end of the war then came back to build schools and return the incredible favor of saving his skin to the locals. Oh, and by the way New Britain has some of the most spectacular potential for cave exploration in the Southern Hemisphere.